Did you know we spend an average of six month standing in line? These restaurants are without a doubt world class taste experiences and you can’t really leave the UK without popping in for a bite, despite the lines. Pro tip: rock up around 3 pm and you won’t have to wait too long at all! 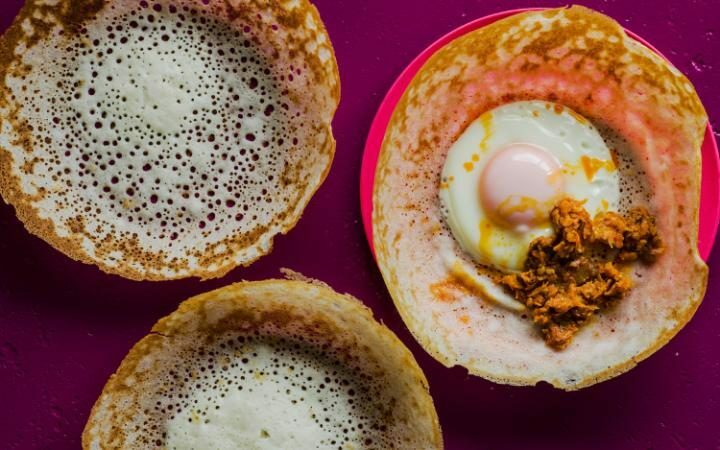 The Sri-Lankan pancakes at Hoppers will have you in a funny state of mind, where you’ve eaten, you’re not full, but boy oh boy are you satisfied … This mouthwatering sensation will have you coming back for more! You’ll want to hold on to that appetite for the afternoon and it’s even one of those nice spots you could head to alone? It’s easier to get a table at a bar for one, and it means more food for you! So you’ve rocked up at around 6 pm, that’s normal dinner time right? Wrong. After about a 45 minute wait you will be experiencing literal hunger pains, but you’ve been told the Taiwanese Steamed Buns would make booking that cheap holiday to Asia for a food tour an absolute joke. And they were right. Opt for an early dinner, mid-afternoon. You’re on holidays after all, who needs traditional meal times? East meets West. The perfect yet confronting combination of what India would have experienced when England rocked up. They’ll be a minimum 30 minute wait but lucky for you there’s a bar, so head downstairs into atmospherically dimmed lighting and exquisite furniture that will leave you a mesmerised while your eyes adjust and mind goes to peace because you can kiss your phone reception later. But this time you’re smart, it’s 3 pm, you’ve had late breakfast but the aromas at Dishoom are driving you nuts and you need to try something! The bartender recommends Viceroy’s Old Fashioned, you ignore the clock and realise it’s your initiation into an incredible experience. Chatting with friends, time virtually flies and before you know you’re being seated at a table upstairs where the world’s longest food menu arrives. Mix it up. Meals at 3 pm, why not?